Merlin Ivan Bishop, 98, passed away on March 30, 2016, at home surrounded by family. Merlin was born in Delta, Utah on January 21, 1918, to Raymond Spencer Bishop and Annie Maria Hilton. He married June Aileen Adams on August 28, 1942 in the Salt Lake Temple. They were the proud parents of Ronald Bishop, Sue Ann (Dean) Vernon and Robin Lynn Bishop. Their posterity includes 5 grandchildren and 18 great grandchildren. He served his country in the U.S. Navy during WWII as a Naval Aviator. 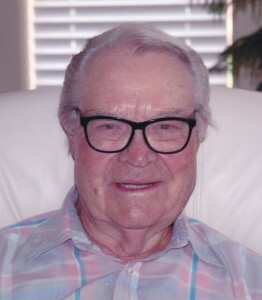 Merlin attended Utah State where he earned a degree in forestry. After a career in the U.S. Forest Service, he retired as the supervisor of the Dixie National Forest in Cedar City. The love of his life June Bishop passed away in October 2011. He was an avid sports fan and played golf with family and friends until he was 96. He was loved and admired by everyone for his positive and grateful attitude. He is also preceded in death by his parents and his daughter Robin Lynn Bishop. Monday, April 4, 2016, at 10 a.m. at the Cross Hollow Stake Center, 2610 West Cody Drive, Cedar City. A viewing will be held on Sunday, April 3, 2016 from 5:00-6:30 p.m. at Southern Utah Mortuary, 190 North 300 West, Cedar City. On Monday, April 4, 2016, the viewing will be at the Church from 8:30-9:30 a.m.
Interment will be in the Cedar City Cemetery under the direction of Southern Utah Mortuary.